Recently I drove along with our President and Director of Business Development to one of our current landscape installation projects in the East Bay. It’s the West Gate Cherry Tree Project in Berkeley. In fact, it is right outside of the west entrance to UC Berkeley. The purpose of the project is to recognize the societal contributions of the Japanese graduates. It was entirely funded by the California Japanese American Alumni Association. The project includes – planting 35 Akebono flowering Cherry trees on the University Drive medians. Incidentally, the common name for these trees is “Daybreak Cherry tree”. Akebono means daybreak or dawn in Japanese. They bloom magnificently in the spring and happily, they are drought resistant. We are also planting Agapanthus, Hypericum, Prunus trees and installing mulch on the University medians. 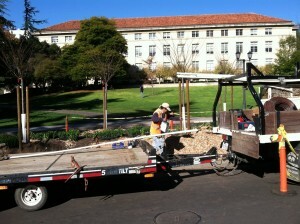 Replacing what used to be turf with trees and plants supports Berkeley’s campus sustainability goals. The project also includes irrigation installation. The University expects that the conversion from turf to plants will save the University approximately 40,000 gallons of water a year. It was a great to see the project – in progress – and to get a few photos of our smiling Gardeners’ Guild people. See the photos. More to follow. The GGI crew involved with the UCB West Gate installation really demonstrated a high level of professionalism, skill and knowledge. 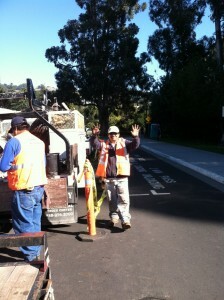 They really set a high standards for safety on the project in the interested of pedestrian and roadway protection. Look forward to seeing the project develop over time and especially look forward to seeing the Cherry Tree in full bloom in the spring.